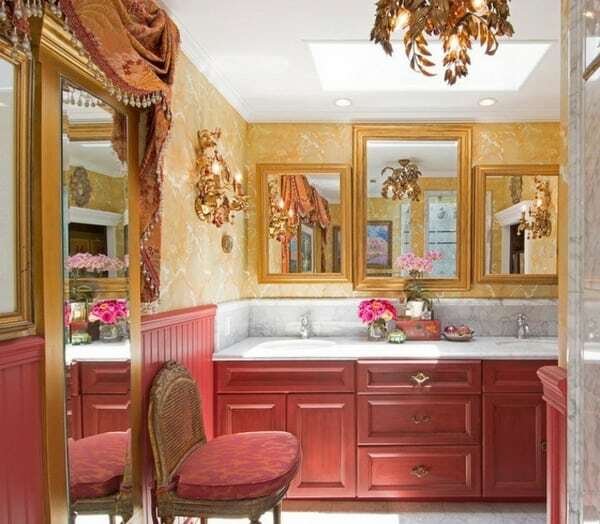 A Long Narrow Bathroom is a design challenge for even the most seasoned professional. The trick is to use design principles to create the illusion of space while also developing a room that is functional. With a few tips and a little trial-and-error, you can create the perfect bathroom designs for an imperfect space. Before you can begin any remodel, you must know what you are working with. Measure the room from wall to wall to create the footprint of the room. Measure the height of the walls, noting any windows. Draw out the footprint of the room on a piece of graph paper to create a floor plan. Allow one square on the graph paper to equal 1 square foot in the room. The bathtub is the largest item that needs to fit within the space, which makes it a logical place to start your remodel. If you have a wall that is 5 feet long, you can comfortably fit a bathtub. If not, consider a standing shower instead. 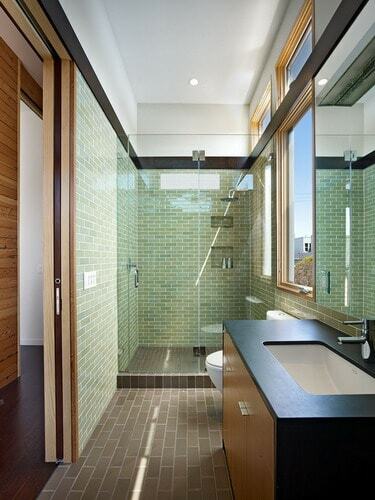 Place the bathtub or shower against the short wall to open up the rest of the space. If there is a window against this wall, use a transparent glass enclosure on the shower and make certain that the window frame material is waterproof. 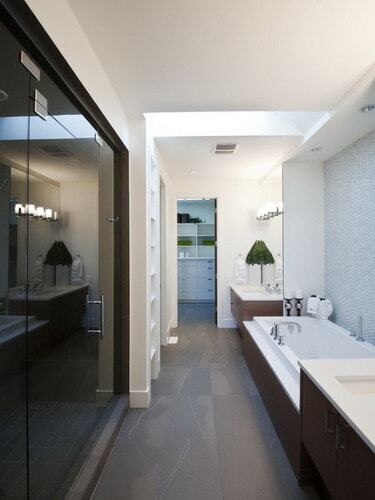 Draw the shower or bathtub into the floor plan to help you plan the rest of the available space. 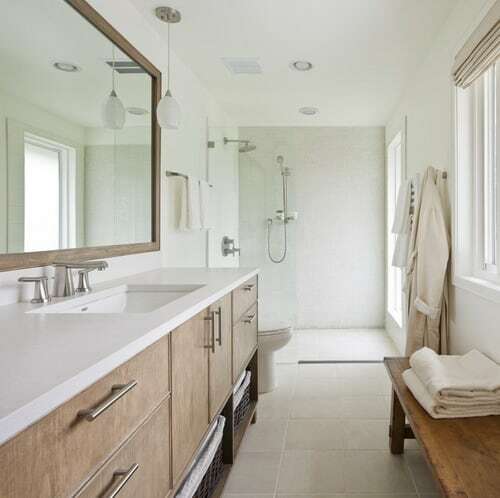 Besides the shower or bathtub, the other essential items in a Long Narrow Bathroom are the lavatory and the toilet. Because the room is narrow, place both of these items on the same long wall to create an open space for traffic along the other wall. 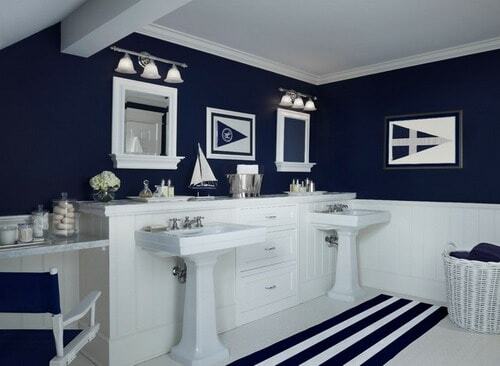 To increase both the visual space and the foot space in the room, consider using a wall-mounted toilet and sink. The absence of a base underneath tricks the eye into thinking the space is larger than it is and makes the room feel less cluttered. Modern wall-mounted options are much more attractive than the commercial models of yesteryear. If a wall-mounted unit isn’t your thing, however, a pedestal sink creates a similar illusion of space. Draw these items into the floor plan. Play with the arrangement until you have at least 21 inches of space in front of the tub or shower, 4 inches of space from the edge of the lavatory to the wall, toilet or door and at least 15 inches of clearance around the toilet. To maximize the space in the room, use built-in wall shelves to create storage and extend shelving up to the ceiling. To help create the illusion of a space that is more square in shape and not so narrow, paint the short walls a dark color and the longer side walls a light color, or use dark tiles on the end walls and light tiles on the long walls. If you have extra space along the long wall, add storage shelves. Use light fixtures that mimic the shape of the room: Install long lights along the long walls and sconces or short lights along the short walls to prevent drawing attention to the shape of the room.